If your kitchen looks like it could be on the set of "The Brady Bunch," it's time to renovate. From small makeovers to complete kitchen design and remodeling, Erix Home Improvement LLC's experienced kitchen renovation team will walk you through every step of your project. Erix Home Improvement LLC has been in the home improvement business for 7 years, specializing in large and small kitchen remodeling projects. Call (240) 207-1192 to find out how you can add work space in your kitchen with a custom island, built and installed by Erix Home Improvement LLC. Make your kitchen work harder for you with a custom island, built and installed by Erix Home Improvement LLC. 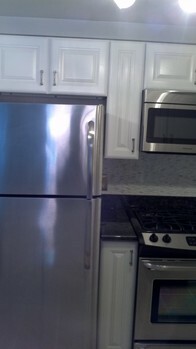 Erix Home Improvement LLC has 7 years of experience renovating kitchens. Update plumbing, including proper venting, to be up to code. Update electrical to meet code. Add a ceiling fan, update light fixtures, add task lighting or under cabinet lighting. Call Erix Home Improvement LLC, the kitchen remodeling experts, to find out how you can turn your kitchen into everyone's favorite room in the house: (240) 207-1192.